The majority of people enjoy fireworks at night but daytime fireworks are becoming more popular – check out the example of daytime fireworks below. So, the guys from ‘the slow mo guys’ decided to go even bigger and better – check it out below. You may remember having read the recent blogs about forthcoming competitions we have a couple of updates for you. The Malta International Firework Competition gets underway soon for the 18th edition of the event and there are representatives from Europe and beyond. Last year’s overall winner was the team from the USA – Rozzi Fireworks who took home the gold closely followed by the local team St Mary’s Fireworks from Ghazaq Malta with the 2nd runner up from the UK – Phoenix Fireworks. If you missed out on the original blog, here is a link to take you straight to it. If you know of any competition/firework events either here in the UK or overseas, let us know. Easter 2019 is almost upon us and as here in the UK we celebrate with Egg hunts, chocolate and the resurrection of Jesus from the dead, in Florence, they celebrate a little differently…… with fireworks!! Now one of Europe’s grandest Easter spectacles, the ceremony dates to the time of the crusades and celebrates the brave deed by Florentine Pazzino. According to the local tradition, Pazzino was the first to climb the walls of Jerusalem and raise the Christian banner above the holy city in July 1099. This brave deed won him respect among his comrades and his commander and he was rewarded with two shards of stone from the Holy Sepulchre. These shards were later used to start an annual “Holy Fire” during Holy Week, this ritual fire would be carried through the city as a religious relic. From then on started the tradition of the scoppio de carro (explosion of the cart) and by the middle ages where the flame was carried by a single cart. By the 15th century, this has grown into the fantastic structure that you will see today and is now pulled by white oxen dressed in flowers and foliage from the first of the spring plants. Accompanying the cart, a procession of Florentines officials, clergy, drummers, flag throwers and a marching band all dressed in historical costumes. The procession begins at the Porto al Prato and then moves onto to the main stage of Piazza del Duomo where all the action happens. Just before 11am during mass in the Duomo the bells ring out from the church for 10 minutes solid. After this time a rocket shaped as the dove of peace is lit and sent on its flight from the altar out into the square. 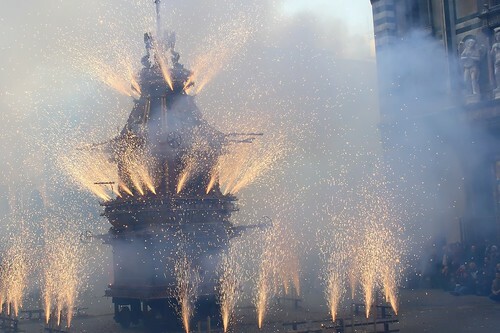 As the holy fire of the dove hits its mark on the cart, the gunpowder loaded cart is set alight and smoke billows and flashes of light and sparks begin to erupt from inside. the anticipation of the crowd that has gathered outside builds as the dove has to complete its journey both ways smoothly to ensure a good omen and ensures a good crop for the season. The fireworks blast out for over 20 minutes producing a magnificent display, if you fancy celebrating Easter differently then head along to the Scoppio del Carro, you won’t be disappointed.